Big Sky Basketball: Is Chehales Tapscott The Best Post Player In The Big Sky? Is Chehales Tapscott The Best Post Player In The Big Sky? If you ask college basketball fans across the country who Chehales Tapscott plays for, 99% of them would have no idea (and they would tell you that you spelled his first name wrong - it is pronounced shuh-HAY-less). 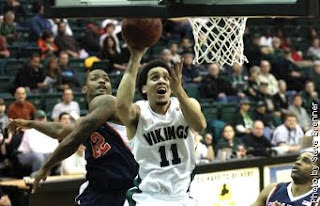 But the joke would be on them, because he just might be the best post man in the Big Sky next season. Tapscott enjoyed solid success in his first season for Portland St, finishing second in the Big Sky in rebounding at 8.1 per game, behind only departed Conference DPOY Brian Qvale. He did this despite injuring his knee in the middle of the season, and despite being only 6'5.''. His percentages back up his rebounding prowess, as he had a 11.8 OR% (130th in the country) and 21.1 DR% (128th in the country). While he was a solid offensive player, he does have some room to improve. He shot only 48.6% from 2s, which is not bad, but definitely a step below elite post players. He does get to the FT line a lot, but shot an average 66%. If he can become a little more efficient scoring the basketball, he will be an All-Conference performer. He had a 14.1 ARate last season, which is excellent for a post player, and really shows his skills. He also led the team with a 2.7 Block %, and also had a solid 2.1 Steal %. He truly does a little bit of everything. And for all of this, he didn't even make Honorable Mention All Big Sky, which is partly a function of your team finishing 7th in the conference. If you are a fan of the Big Sky, you should get to know Tapscott and his game. While you could make arguments for guys like Derek Selvig or Kyle Bullinger for best big man in the Big Sky, an argument could definitely also be made for Tapscott. He is the early favorite to be the Big Sky rebounding champion, and it wouldn't be a surprise to see a line like - 15 PPG/9 RPG/ 2.5 APG/1 BPG/1 SPG. If he can perform like that, Portland State will be a team to watch in the Big Sky race.